The secretive Democracy Alliance donor club is hoping its nearly $300 million in political spending this cycle will result in a new political leadership willing to advance liberal ideas such as the Green New Deal, a private and confidential document obtained by the Washington Free Beacon shows. The document, "Vision for a Progressive America, and What's Needed to Get There," was distributed to Democracy Alliance partners at their spring donor conference in Texas earlier this month. In it, leadership reflects on the effectiveness of the $1.83 billion it has injected into "progressive infrastructure" since its founding in 2005, and lays out agreed upon policy objectives for the coming years. Among those objectives is the Green New Deal, the document states. "A safe and sustainable planet would include a new president and Congress that are positioned in 2021 to advance bold actions, like a Green New Deal, that achieves dramatic reductions in greenhouse gas emissions while creating millions of jobs and reducing economic inequality," the document says. The group puts the failure to advance climate action on itself, arguing that too little investment has been made to combat the fossil fuel industry. "Even as the crisis worsens daily, progressive advocates lack sufficient political power and influence to overcome the fossil fuel industry and its ideological allies," it says. "Too little investment has been made in elections, and the movement generally has not held elected officials accountable for their positions on climate, even as climate denial has become a dominant position for many in Congress." 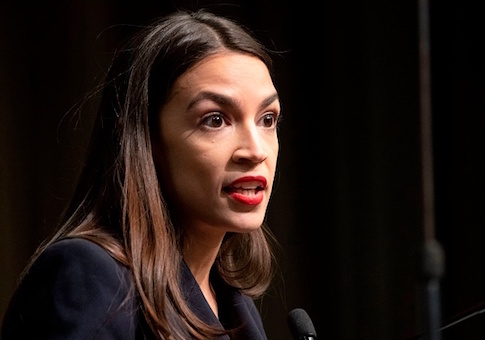 The embrace of the Green New Deal by the influential donor group comes as the radical policy proposal divides Democrats. Just days after last November's election, freshman Rep. Alexandria Ocasio-Cortez (D., N.Y.) staged a sit-in outside House Speaker Nancy Pelosi's office to demand action on climate. But Pelosi, who has headlined Democracy Alliance events alongside billionaire member George Soros, has consistently written off the Green New Deal—as it was unveiled she referred to it as the "green dream or whatever they call it." Democracy Alliance reveals in the document that it is reevaluating its spending strategy after looking at its failures over the past decade. "Our country is enduring an almost unthinkable crisis of democracy that has at the same time brought out the best—in the mobilization of millions and the creation of significant new organizations borne of resistance—and caused us to look harder at our existing strategies, organizations, and movements," it writes. "To alter the current imbalance of power and influence, we must marshal strategic and financial resources with a sense of urgency." The group plans to increase its influence over politics through a massive $275 million spending plan targeted at individual states that was also unveiled at the Texas conference. It also is asking its powerful members to marshal resources beyond money such as "convening power, influence, and relationships" to help advance the group's goal of building a permanent "progressive America." Among the other stated goals in the document are putting resources toward "a robust pipeline of federal judges" to be selected by a future Democratic president and a "well-resourced strategy for blocking right-wing judges." The group of wealthy donors also wants "a reduction of the role of big money in politics," it says in the document. Democracy Alliance indicates in the document that its decision to clearly articulate its policy goals is aimed at increasing spending and engagement to ensure an "enduring progressive future." "We hope that our approach will inspire increased funding among Democracy Alliance partners," it says. "We will also need to become more active ambassadors, sharing our vision with other state and national donors, and building a solid base of support for an enduring progressive future that has a larger and even more passionate and committed Democracy Alliance at its core, but that has influence and impact well beyond our ranks." This entry was posted in Politics and tagged Democracy Alliance, Green New Deal. Bookmark the permalink.